What remains of the Pirelli Tire Building, as seen from the Ikea parking lot in New Haven, CT. Passing through New Haven, CT on I-95, you might notice a large mid-century concrete building – if you’re not blinded by the blue & yellow Ikea building just south of the concrete building. Or perhaps the Ikea advertisement on the building distracts your attention. I hadn’t paid too much attention on this section of I-95 before, and Ikea may have caught my attention first (usually we’re traveling this way after daylight hours). Vinny and I recently stopped at the New Haven Ikea on our way back to Vermont and once I had the time to look at this building, I was struck by its beauty. Normally I wouldn’t characterize mid century concrete buildings as beautiful, but there was something about this one. And it’s smack in the middle of an Ikea parking lot, which seemed odd. We figured it must be Ikea offices. It looked modern, like the general aesthetic of Ikea. Once I started looking, it was not hard to find information about this building. It is the Pirelli Tire/ (originally) Armstrong Rubber Company Building designed by Marcel Breuer in 1968. 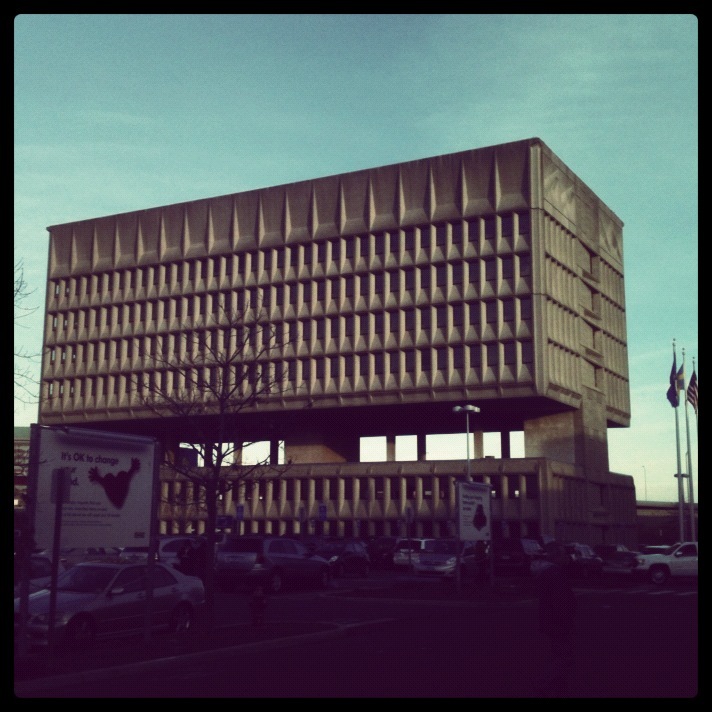 The building was meant to serve as a gateway to New Haven, since it is located near the I-91/I-95 interchange and to mark the cultural rebirth of the city, hence, the choice for a modern building. Read more about the design of the building on the DOCOMOMO_US record. The building was listed in the Connecticut State Register of Historic Places in 2000, which makes it eligible for listing in the National Register of Historic Places. The building has been vacant since the 1990s and there have been a few unsuccessful plans to rehabilitate the building. In 2002, Ikea announced its plan to demolish the Pirelli building in order to create enough parking for its big box store. (It was a huge news story in the preservation world, but that was when I was just learning of preservation so I missed it back then.) Fortunately, they were not successful, at least not completely. The image you see above is only a portion of the Pirelli building; originally the two stories on the bottom extended and those floors served as a warehouse as well as a research and development wing. This image from Architecture Week shows the original building. Pirelli Tire Building. Image via Architecture Week. Click for source. Now, the Pirelli building is overshadowed by the Ikea building. The green space is gone, and the two-story wing is demolished, which destroyed its iconic asymmetry (and possibly its architectural integrity). The building is surrounded by a parking lot. Ikea uses the building as a billboard. See the original extent of the building on A Daily Dose of Architecture. What is the worst part? The building is empty, not even one floor is used for offices or business or anything else. Ikea owns the building. Ikea is probably waiting for the right time to attack and destroy the iconic building (though the company says it is in agreement with the City of New Haven that the building should remain). What is interesting about this? Ikea and Marcel Breuer, Pirelli building architect, have a lot in common. Ikea is known for its modern design using affordable materials and production and distribution. Marcel Breuer, is known for mass producing objects with common materials, such as bent steel tube chairs and Ikea. Wouldn’t you think that Ikea would find this to be an ideal location and a wonderful building to showcase the company? Instead, the building is a billboard for Ikea. Why couldn’t Ikea think creatively about a building? A 2003 Preservation Nation post ponders whether saving half the building was a bad decision or a good compromise. Ikea demolished a significant building (a portion of one, but took integrity with it) for parking spaces – more asphalt. As always, local zoning and architectural appreciation by city officials could have helped to preserve this building or come up with an actual compromise. Of course, retailers such as Ikea should be culturally responsible, too. And now I feel guilty for shopping at Ikea. That is the coolest looking building! Well, Ikea is making a huge mistake by not playing up the significance of a building of world notoriety sitting right in the middle of it’s parking lot. They should shift their offices to the building, install a second large cafe in the pirelli building and install gallery space. They could generate a lot of good will toward the company in erudite new haven and historically aware southern connecticut. What a foolish attitude they’ve taken. I have to say, I shop at this ikea a lot. Now, I also feel guilty about that. I think I’ll be avoiding Ikea now. I have a lot of friends in the are who will feel the same way. It’s a shame they’ve already demolished the lower extension. I had never seen it ’til I saw these pictures. I had a sort of Lever House look. Ikea still has time to turn this around. They are sitting on a public realtions gold mine. Just start with an apology. It would go a long way. Pingback: Tired of guessing yet? | What Building?